November 11, 2010, Felton, Calif. – Desert Dingo Racing announced today that GoPro, maker of the world’s bestselling and highest performance wearable HD video cameras, is renewing its support for the team in 2011. GoPro is providing the race team with two HD Motorsports Hero cameras for the 2011 race season. 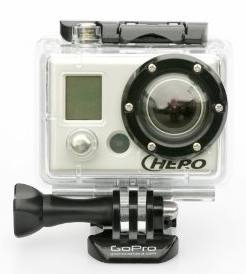 GoPro’s HD Motorsports HERO is the world’s highest performance 1080p HD on-board video and still photo camera. They provide professional quality 1080p, 960p, and 720p HD resolutions record at 30 frames per second (60 fps in 720p). The HD Motorsports HERO easily mounts to any helmet, motorcycle, ATV, car, plane, jet ski, boat, snowmobile or other vehicle. The camera’s quick-release mounting design makes it easy to re-position the camera around your vehicle for professional quality HD video from several angles. GoPro cameras record up to 2.5 hours on a single charge and up to 9 hours total on a 32GB SD card (not included). They can also shoot automatic 5MP photos at 2/5/10/30 and 60 second intervals during your drive or ride, hands free. Press the shutter button once and record up to 2.5 hours of poster-print quality photos. Based in Half Moon Bay, California, GoPro is the world’s leading manufacturer of ultra-convenient wearable and gear mountable digital cameras. Since 2004, GoPro has been designing cameras and accessories that make it easy for people to capture images and video during their favorite activities. Its products include the patented HERO line of shockproof/waterproof wearable cameras and gear-attachment devices.